Artists, Revolt. A response to Old Navy. The most recent Old Navy t-shirt offering is yet another reminder of the lack of understanding of and respect for among the most noble of all professions: artists. First off, a look at what the term itself encompasses: to the creative world, “artists” is a single word that defines a broad spectrum of talent. Whether visual artists or writers, musicians or dancers, architects, photographers, art directors or graphic designers, filmmakers or actors, publishers, culinary artists, or even creative visionaries/thought leaders, anyone who creates is an artist. They share a similar passion, an unquenchable thirst, a belief that their contributions, be they large or small, can make the world a better place. And they do so with great joy. Because, after all, that’s what art is. Pure joy. And indeed, artists have changed the world. Can you imagine a world without the likes of Rembrandt, Beethoven, The Beatles, Shakespeare, Hemingway, Baryshnikov, Ansel Adams, Frank Lloyd Wright, Stephen Spielberg , Rolling Stone, Emeril Lagasse or John Besh? Those who are fortunate enough to create for a living, and not rely on a second job to support their “starving artist” passions, truly are among the most blessed. 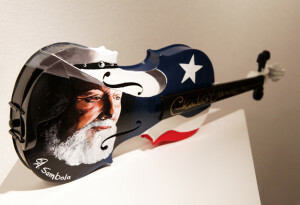 When a disaster occurs, or a non-profit organization or cause or grass roots effort needs revenue to sustain its operations, its fundraisers turn to artists for contributions. They ask for donations of time and talent in the form of free artwork, music, graphic designers, catering, print and broadcast advertising and more, all to help the cause. The same holds true of a myriad of non-profits that host events to raise funds for their organizations, and rely on the generosity of artists as key elements of the efforts. And give, the artists do. It’s time we all step back and acknowledge that while it is noble to give, it is not acceptable for takers to continue to take, with the often empty promise of “great exposure” for the artist, especially when such often amounts to a little two inch by three inch card alongside the artwork at a fundraising gala, or mention of the band in the press release. Empty promises don’t pay the bills. Until such time as artists are treated with the same respect as other professions, things will not change. And this is one reason the Old Navy offering is absolutely unacceptable. It sends a much larger message to the many aspiring artists whose names someday may very well take their places in history, much as those of their predecessors, as the standard to which future artists should aspire. So shame on you Old Navy. And shame on the creative team whose concept this was, and to the graphic designer who sold out for a paycheck by condemning his or her colleagues. It’s time we celebrate artists for all that they do—make us think, and feel, dream and be. Creatives document history, shape the present, and in many ways, create the future. And we will be damned if we’ll let a $10 t shirt take that away from us. Starr Struck. 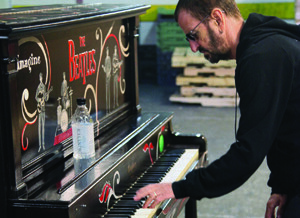 A Beatle, a piano and holy expletives. Peace, Love and Hope for the Future. A Beatles Fairy Tale.